As an experienced attorney of over 15 years with a background in child and family related legal issues, Catherine’s practice is focused on reproductive law matters. Catherine regularly represents intended parents, donors, and surrogates in family building arrangements. Catherine has worked with clients on legal agreements for surrogacy, egg donation, sperm donation, and embryo donation matters, and she handles the court process involved with family building, including pre-birth orders and second parent adoptions. Catherine is active with legislative matters impacting fertility treatment, and is a co-author of New Hampshire’s modernized surrogacy and parentage laws. 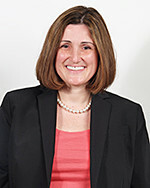 Catherine is also active with advocacy and serves on the Board of Directors for RESOLVE New England and is the only New England attorney appointed to the Executive Council of the American Bar Association’s Assisted Reproductive Technologies Committee. Having been through far too many rounds of IVF before finally conceiving her twins, Catherine is a strong supporter of patient advocacy and education. Prior to opening her own firm, Catherine worked at the New Hampshire Attorney General’s Office and the Suffolk County District Attorney’s Office in Boston, where she achieved landmark verdicts in complex child and family abuse cases. Catherine is admitted to the bars of both New Hampshire and Massachusetts.